When most nutrition professionals think about peas and science, they recall botanist Gregor Mendel and his studies on genetics that used peas to demonstrate the existence of recessive and dominant genes. The science and uniqueness of peas didn't end there. The one plant food that dietitians are sure to see more of on Americans' plates is the pea. Peas, the seed of the pod fruit Pisum sativum, are in the legume family and one of the few nonbean legumes. Green peas, as they're called when ripe, usually are sold and prepared as a fresh vegetable. Dry peas, which can be green or yellow, are used similarly to lentils. They're harvested when fully matured and are most commonly available as "split" peas. Peas are nutrient dense, phytochemical rich, easy to grow using few resources, and on their way to becoming a popular "new" food that ironically has been around for a long time. Peas are an excellent source of many nutrients including fiber, vitamin K (found especially in fresh peas), manganese, folate, copper, and phosphorus. They're also a good source of vitamins B6 and B2, niacin, molybdenum, zinc, protein, magnesium, iron, potassium, and choline. In addition, peas and pulses are low-cost sources of phytochemicals and a staple in billions of people's diets around the world. The benefits of fiber on health outcomes are well established. One cup cooked green peas provides 7.5 g total fiber: 2 g soluble and 5.5 g insoluble. One cup cooked dry peas contains 16 g total fiber: 5 g soluble and 11 g insoluble. This is a significant amount of fiber relative to the average total American intake of 13 g per day. Legumes, like peas, are an easy, affordable way to boost fiber consumption. Peas, both fresh and dry, are significant sources of iron, zinc, and potassium—key nutrients in plant-based diets. Fresh peas, like the green vegetables they're often associated with, are an excellent source of vitamin K. Dry peas don't contain significant amounts of vitamin K, but both types are good sources of the B vitamins B6, B2, niacin, and folate. Inevitably, the question of protein intake and protein quality arises when plant foods and plant-based dietary patterns are discussed. Fortunately, legumes are an excellent source of protein, and peas are no exception. Green peas, which are the immature versions of the seed, are 25.5% protein. Dry peas are slightly higher at 27.7% protein. 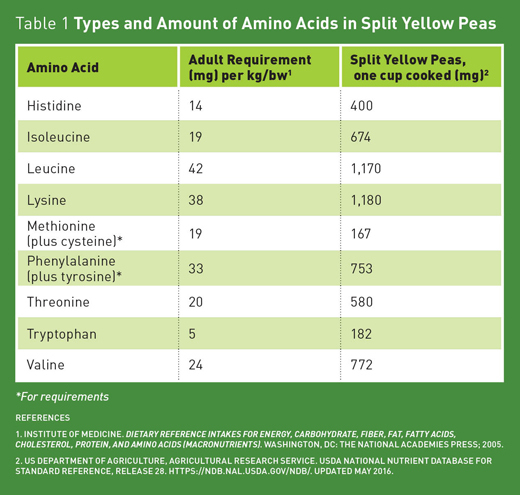 Most pea-based products use the dry bean, as reflected in the amino acid content per serving of dry peas in Table 1 on page 34. Like other legumes, peas are high in the essential amino acid lysine but low in methionine. Adequate lysine consumption is an important consideration for those eating predominantly plant foods, but pea protein can supply it in adequate amounts when consumed regularly. And it's the protein component of peas that makes them a useful ingredient in new products. The refinement of any food into one component removes other potentially beneficial compounds. However, Table 1 shows the extent to which the dry pea is a nutritional powerhouse, and to whittle it down to only protein could be viewed as a disservice to the profound benefits of whole plant foods. With that said, however, pea protein as an ingredient is opening doors to new versions of foods and has a usefulness that goes beyond nutritional makeup. Following are the foods in which pea protein is used. On the forefront of developing new foods with pea protein is Hampton Creek, makers of Just Mayo, which entered the mayonnaise market a few years ago. The company also is using pea protein to develop egg-free cookie batters and an egg alternative consumers can use to make scrambled eggs. At one time soy was virtually the exclusive dairy alternative, but now plant-based milks including rice, oat, coconut, almond, and hemp are available. One concern with most of these plant-based milks is that, unlike soymilk, they're low in protein. Despite the decent amount of protein in almonds, almond milk contains very little protein per serving. The same holds true for the other varieties, with the exception of hemp, which, due to its strong, nutty taste, isn't as popular among consumers. Now, pea milk has entered the milk alternative market. Because peas are high in protein, these milks contain as much protein as soy and cow's milk. Ripple Foods, maker of Ripple milk, is one company that believes pea milk is the future milk because of its nutritional content and reduced environmental impact. According to Lance Kizer, PhD, head of research and development at Ripple Foods, the pea is an optimal ingredient across a wide range of metrics. The focus in development was a more environmentally friendly milk, and peas fit because they're commonly grown in North America, have lower CO2 equivalents, and use less water than almond or dairy milk in production. "In the United States, dairy milk is essentially corn-based milk made using the cow as a very inefficient factory," Kizer says. "So all the fossil fuel-derived fertilizer and fuel inputs that go into growing the feed corn, and all the methane released from the cow's intestinal gas and manure contribute to the very high greenhouse gas emissions. In contrast, all plant-based milks eliminate the greenhouse gas that come from growing and maintaining the cow." The challenge, Kizer says, is the consumer who prioritizes cost, taste, and nutrition over other concerns. Eliminating the beany taste of plant milks, for example, is a significant barrier. Plant-based proteins such as pea or soy often contain small flavor molecules that contribute to a beany or grassy flavor consumers often don't like. "One thing Ripple Foods really focused on was developing a gentle and environmentally friendly manufacturing process that purifies pea proteins away from those off-flavor molecules so that we don't have to use a lot of added flavors or sugar to mask them," Kizer says. Consumer demand for vegetarian and vegan burgers can be placed into two categories: those who want a vegetable-based patty that's healthful and can be eaten as a sandwich or burger, and those who desire the taste, texture, and feel of animal-based burgers. Beans and legumes historically have been used for both types. However, the new product developments accommodate the latter: plant-based burgers that replicate the experience of eating meat. This market is targeting not only meat avoiders who may desire the taste of traditional burgers but also omnivores interested in decreasing the amount of meat they eat. Possibly predicting the direction of the market, Tyson Foods recently bought 5% stock in a producer of vegan burgers called Beyond Meat. The Beyond Burger is a pea protein isolate-based burger with 20 g protein per serving. In their aim to duplicate the taste and texture of meat, the patty also contains 22 g fat, five of which are saturated. Peas are naturally low fat; the fatty acid sources in the burger are from canola and coconut oil. One patty also contains 25% of the RDA for iron and 90% for vitamin C, the latter of which isn't found in traditional beef patties. Supplements, especially protein powders, are a billion-dollar industry. Consumers are interested in not just the amino acid content of different powders but also the sources. Because many people are avoiding dairy as well as soy due to their lack of knowledge of soy's safety, pea offers an alternative to both. Pea protein powders don't contain the common allergens soy, egg, and dairy. However, protein supplementation, including pea, may be beneficial for athletes with high protein requirements and fewer caloric needs such as bodybuilders, small athletes who have trouble eating enough whole foods to fuel workouts, and vegan athletes with limited time for food preparation. As new products are developed and consumer interests change, the agricultural landscape also will change. Peas have a low environmental impact because of their ability to fix nitrogen in the soil, reducing the need for nitrogen fertilizer. Peas also have a shallow root system and don't require large amounts of water to grow. Experts believe sustainability must be the future—in nutrition and otherwise. The previous 50 years involved increasing production of edible crops on an unimaginable scale. But with the increase in quantity, there was a profound decrease in variety. The next 50 years may require us to produce a greater variety of crops and foods to meet the needs of a growing population. Environmentally friendly, nutrient-dense, protein-rich legumes, such as peas, that are easy to grow using minimal land will inevitably be a part of the solution moving forward. 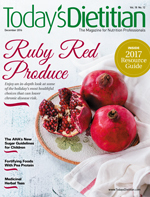 Dietitians are uniquely qualified to reach consumers with new information on not only healthful diets but also sustainable food practices. And these new food science discoveries will help meet that goal. — Matthew Ruscigno, MPH, RD, is the past chair of the Vegetarian Nutrition Dietary Practice Group of the Academy of Nutrition and Dietetics and coauthor of No Meat Athlete. He has a private practice in Los Angeles. 1. Alternative proteins to claim a third of the market by 2054. Lux Research website. http://www.luxresearchinc.com/news-and-events/press-releases/read/alternative-proteins-claim-third-market-2054. Accessed October 23, 2016. 2. Future of food. Bill & Melinda Gates Foundation website. https://www.gatesnotes.com/About-Bill-Gates/Future-of-Food. Updated March 18, 2013. Accessed October 23, 2016. 3. Hernández-Ramírez RU, Galván-Portillo MV, Ward MH, et al. Dietary intake of polyphenols, nitrate and nitrite and gastric cancer risk in Mexico City. Int J Cancer. 2009;125(6):1424-1430. 4. Gee K. America's dairy farmers dump 43 million gallons of excess milk. The Wall Street Journal. http://www.wsj.com/articles/americas-dairy-farmers-dump-43-million-gallons-of-excess-milk-1476284353. Published October 12, 2016. Accessed October 28, 2016. 5. Bernstein AM, Ding EL, Willett WC, Rimm EB. A meta-analysis shows that docosahexaenoic acid from algal oil reduces serum triglycerides and increases HDL-cholesterol and LDL-cholesterol in persons without coronary heart disease. J Nutr. 2012;142(1):99-104.